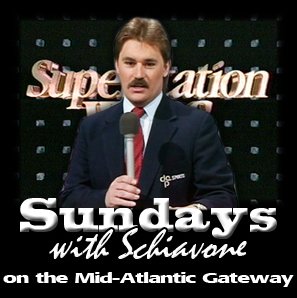 The Mid-Atlantic Gateway is on a short hiatus. Back with you soon! 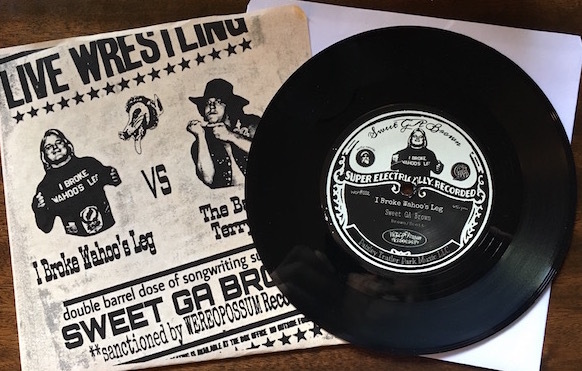 To enter by Friday 7/28, go to the Two Man Power Trip Facebook page, "like" their page, and be sure to "share" the give-away graphic in their feed. You will then be automatically entered to win "Four Horsemen", "Big Gold", "Ten Pounds of Gold", and some cool Four Horsemen goodies to boot! The 2017 Johnny Weaver Cup Tournament, now in its fourteenth amazing year, is underway at CWF Mid-Atlantic Wrestling. The second rounds take place this weekend (Saturday 7/29) at the Mid-Atlantic Sportatorium in Gibsonville, NC at their "No Excuses" event. All roads lead to the final four of the tournament which will take place Saturday, 8/26. 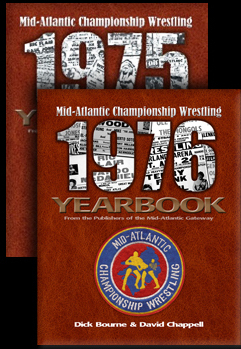 In November of 1975, fans of the Mid-Atlantic area were introduced to a fearsome newcomer…one who would wreak havoc in Jim Crockett Promotions for the next calendar year. Mosca bellowed, “l told you about my formative years and my deeds and my charisma and my character, therefore they have developed since my childhood and therefore I shall not lose and will not lose, believe me! 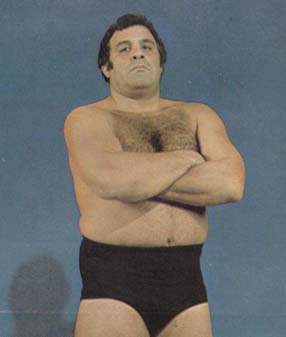 Angelo Mosca didn’t lose much during the following twelve months, becoming the Mid-Atlantic TV champion and along with Ric Flair and Blackjack Mulligan ran roughshod over many of the Mid-Atlantic fan favorites during 1976. And while Angelo appeared back in Jim Crockett Promotions for sporadic shots from 1980-84, to me, he was never as menacing as he was as that “Madman” that suddenly appeared on the Mid-Atlantic scene back in November of 1975. 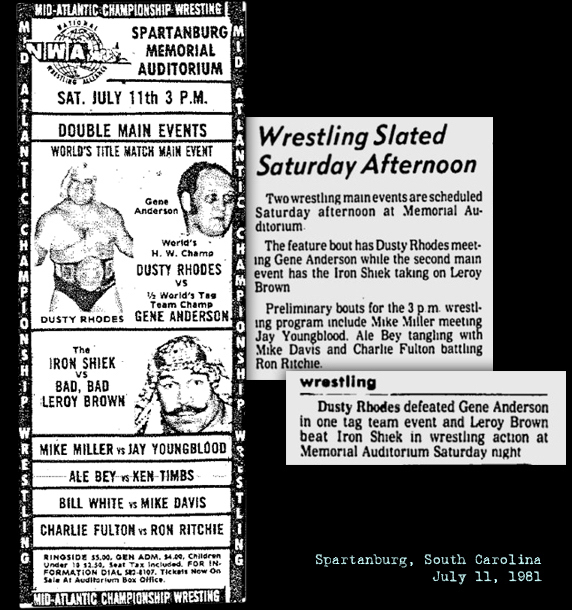 It has been awhile since we've had a BLOOPER newspaper clipping on the Gateway, so that feature returns with two odd names showing up for a December 1975 show at the Coliseum in Winston-Salem, NC. These aren't so much funny as just interesting. How do these things happen? Bad handwriting? Misunderstanding what was read out over the phone from the Charlotte office? Or from the local promoter to the newspaper office? Regardless, there appears to be a new man in town to face Blackjack Mulligan by the name of TROY Atlas. And on the mid-card, a newcomer by the name of MICK "The Judge" DuBois is facing Roberto Soto. And he's stolen Mike DuBois's nickname! Is there room for more than one "Judge" in town? There are some misspellings as well (Don SORRANO), but those aren't really considered bloopers and are to be expected in almost every wrestling newspaper ad. 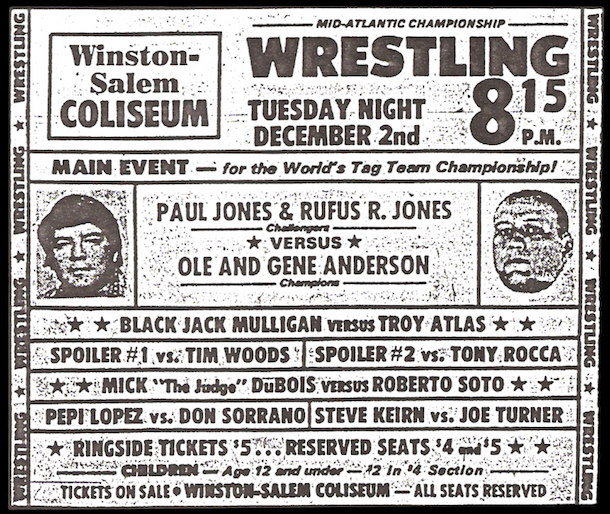 Nice main event, though, as Paul Jones teams up with Rufus R. "Freight Train" Jones to challenge the Anderson Brothers for the NWA World's Tag Team Championship. When I first got hooked on wrestling as a young teenager, I loved the team of "the Jones brothers!" Check out all the previous Bloopers we've featured before on the Gateway! 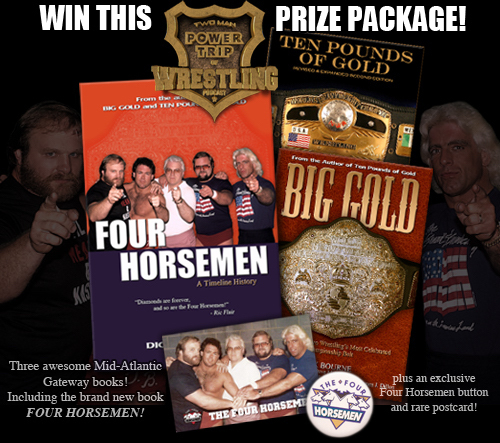 Win a copy of the new book FOUR HORSEMEN as part of a big prize package given away on the TWO MAN POWER TRIP OF WRESTLING podcast. 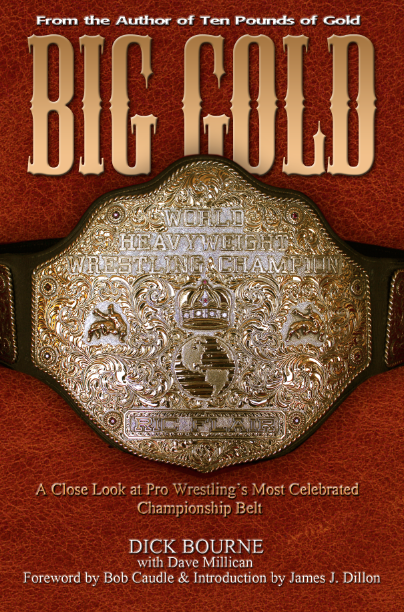 (1) the new book "Four Horsemen - A Timeline History"
(2) the book "Big Gold"
(3) the book "Ten Pounds of Gold"
Support our friends Chad and John over at the Two Man Power Trip and subscribe to their popular podcast, part of Sports Illustrated's list of "Golden Age of Wrestling Podcasts." A lucky winner will receive this great prize package! Want to order any of these books now? Head on over to the Mid-Atlantic Gateway Book Store now! 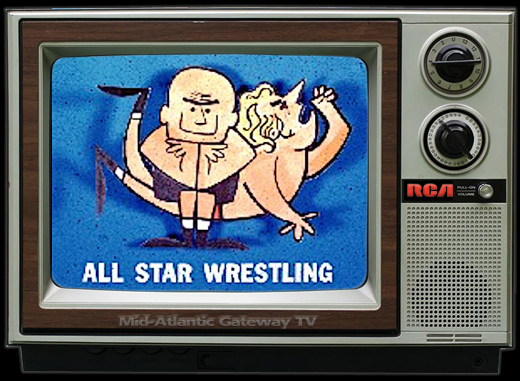 And thanks for your support of the Two Man Power Trip of Wrestling and the Mid-Atlantic Gateway. 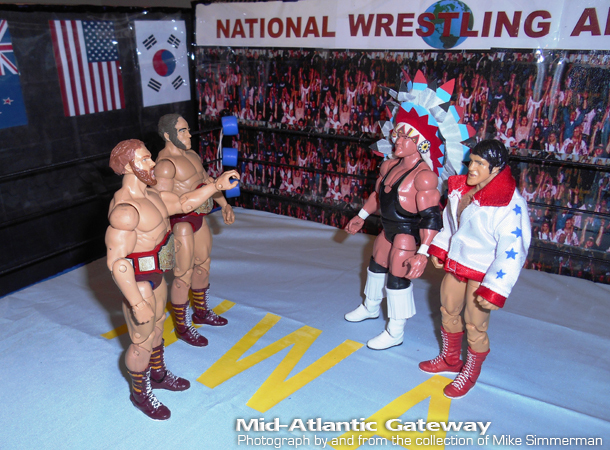 Last week we debuted out new series called "Action Figures Friday" and featured a classic look at the feud of the year in 1975: Wahoo McDaniel and Paul Jones vs. Gene and Ole Anderson. This week we jump to 1982 and take a look at one of the greatest teams in Jim Crockett Promotions history Ricky Steamboat and Jay Youngblood. They stand in the ring challenging Sgt. 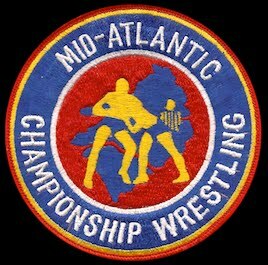 Slaughter to go get his tag team partner Don Kernodle and defend their NWA World tag team championships on Mid-Atlantic Championship Wrestling. Another great shot from collector Mike Simmerman. We appreciate him sharing his figures and his photographs with all of us on the Mid-Atlantic Gateway. Another great shot coming next week! 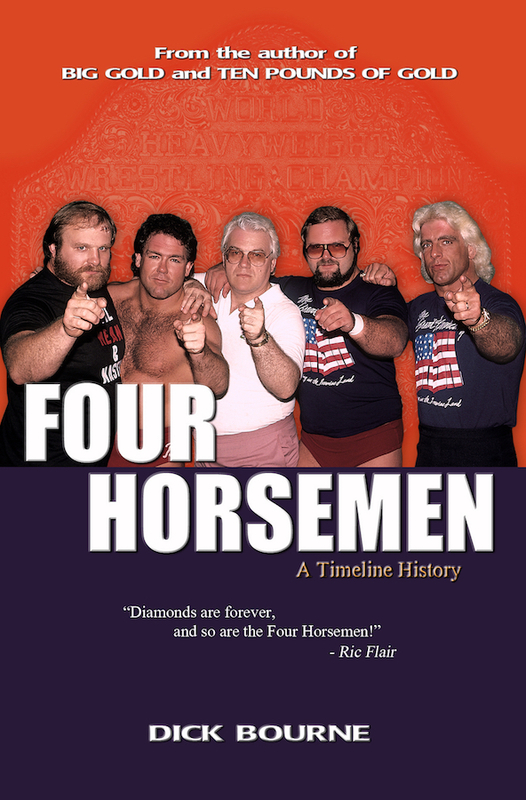 Author, journalist, and blogger Mike Rickard recently wrote a great review of our book "Four Horsemen" which appears on the wrestling website "Canadian Bulldog's World." We very much appreciate his very kind and thoughtful review. His review is also posted at Amazon on the Four Horsemen book's page. 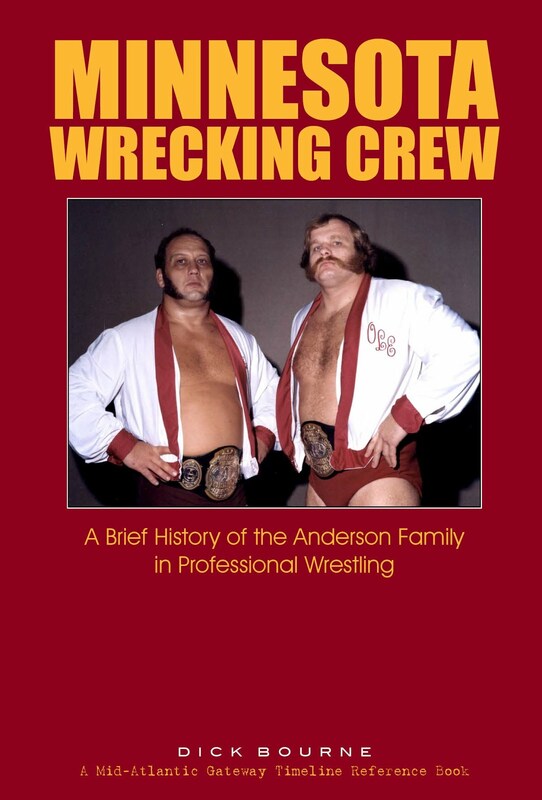 Mike is the author of "Wrestling's Greatest Moments" (ECW Press), published in 2008, which chronicles some of the greatest moments and matches in wrestling history. Please check out Mike's review through the link below. Our book "Four Horsemen -A Timeline History" is available for sale on Amazon.com and in our site's Book Store. Legendary referee from Jim Crockett Promotions Tommy Young made a recent appearance on the Two Man Power trip of Wrestling (@TwoManPowerTrip) with Chad and John. Tommy doesn't do many of these things, so it was cool to see this happen. Some very funny stuff here, too! The full TMPT episode with Tommy can be found by clicking here. "It was such an honor and it was really great that we all came along at the same time. Flair broke in about the same time I did in '73 and he was here in the Mid Atlantic and virtually all of my career was here for the Crockett Family in the Mid Atlantic area. I saw Steamboat years earlier and I told George (Scott) that you may want to take a look at this kid because the audience loved him but it was Flair ultimately that went to George and said to give him Steamboat. They just complimented each other so well and drew nothing but money and by the grace of God I came along at the same time and we all got together and they knew that they could do anything and I'd be there for them because they loved to do the false finishes and I could do that 1,2 and come out of it the last second and sometimes I'd show with my hands how close it was and I never saw anybody do that up to that point and it was just something that happened. Sometimes I would fly and slide across the ring and even take a bump to the floor and bang myself up to just show the hustle of it. It was such an honor to be in there with those two guys and I have nothing but respect for them and they are my heroes. They made me a good living and "we" drew so much money in every town. The better the house, the better the payoff." "If you watched a Flair/Steamboat match, they rarely went home before the 40 minute time mark. These guys always wrestled for a good while and sometimes they'd go 45-50 minuets. There was a situation one time where Flair had an accident and he ate too close to the matches and I don't want to get too graphic because I have talked about this before but I think we've all had a situation in our life where we couldn't hold our load so to speak (laughing) and had an accident in our britches, it has happened to me and on this particular night it happened to Ric and we were in a SOLD OUT Charlotte Coliseum and about 12,000 people in there and it wasn't like: "OH! Gotta go, gotta go." They went another 7-8 minuets and needless to say things didn't smell too good but it was a bad situation and the only time that it ever happened." "You can see the injury anytime you want, just pull up Tommy Young on YouTube and it shows what happened to me and how I broke my neck and where you don't see me get hurt, you see me disappear from the picture and I'm laying there. That ended my career. A guy gets careless with me and I get my neck broke. Goodbye career. I am not bitter about it anymore and I don't know that I ever really was bitter because it was an accident but it was also careless and it probably cost me a million dollars in lost wages." "Earl is still doing it and he isn't doing it that much but he is still doing it and I find that amazing that Earl can still do it. I have so much respect for him and I'll tell you something else too, I did not train Earl. He tells most people that I trained him but he is just saying that to put me over because I didn't train Earl, Earl learned on his own just like I did." The very first night that I was introduced and was "invading" the WWE, Corny put me over like crazy and Jim Ross and Jerry Lawler were doing the commentary at the time and I did a match with The Rock N' Roll Express and The Headbangers. Later I did a match for Barry Windham teaming with Bradshaw (John Layfield) and they were The New Blackjacks and Barry turned on him and Layfield came back and we all had to bail out of the ring and that was on a Monday. On Tuesday I was coming down the ramp to do a return match between the Headbangers and The Rock N' Roll and Sgt. Slaughter came down with Earl and pulled me since I was not a WWF official and since I was with the NWA had to leave. I went to the ring and did not ref, I simply walked back up the ramp and that was the end of it. I got good money for the two shows. 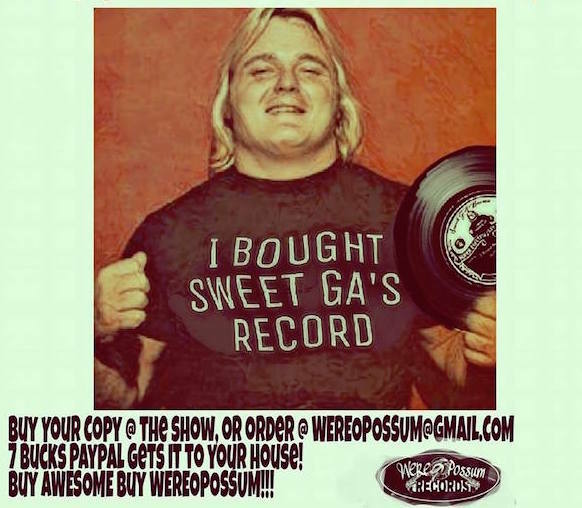 I was originally going to be given some house shows here in North Carolina before somebody woke up and said wait a minute, Tommy Young sued Turner so we can't use him. Corny called me up and said they were going to have to back out of those bookings and I said that now you guys finally have come to your senses and I can't believe you ever let me in the ring in the first place." "I stopped by while they were setting up and "Robby" my old buddy Charles Robinson who is working for them right now got me in. It is different now, when they set up a show they've got like 20 trucks out there and the equipment they use now is unbelievable. When they used to come to Charlotte I could walk in and out of there and even had walked into an interview and they didn't get upset with me but this particular time he had to get me in and he had to get me a pass. I just wanted to say hello to some of the agents and they were really the only guys that I still knew." "This big bald guy comes up in a suit and we didn't pay any attention to it and he asked to speak to me and the next thing I know he is walking me out and taking my backstage pass and when I asked what he was doing, he said he wanted me out and this guy just wanted me out. I thought he was one of the guys at first and he walked me out and I had no idea what the hell was going on. That hurt my feelings and that is something I will never forget." For this and every other episode of The Two Man Power Trip of Wrestling please subscribe to them on iTunes, Podomatic, Player FM, Tune In Radio and The IRW Network, The EXCLUSIVE home of The Triple Threat Podcast featuring Shane Douglas and TMPToW. As well as follow them on Twitter @TwoManPowerTrip. The inaugural Crockett Foundation Cup Tag Team Tournament will be taking place this Saturday, July 15, at the New Kent High School in New Kent, Virginia. The event is being presented by Classic Pro Wrestling with the sanction of the Crockett Foundation. Wrestling legends making appearances include WWE Hall fo Famers the Rock and Roll Express, former NWA World champion Ronnie Garvin, Jimmy "The Boogie Man" Valiant, the "Powers of Pain" Warlord and Barbarian, the "New Fantastics" with Bobby Fulton, noted ring announcer Garry Michael Cappetta, and legendary referees Tommy Young and Dave and Earl, the Hebner brothers. In addition, the Two Man Power Trip of Wrestling will be presenting a Q&A Meet and Greet with former NWA World Champion "Hands of Stone" Ronnie Garvin. That event will take place earlier in the afternoon. 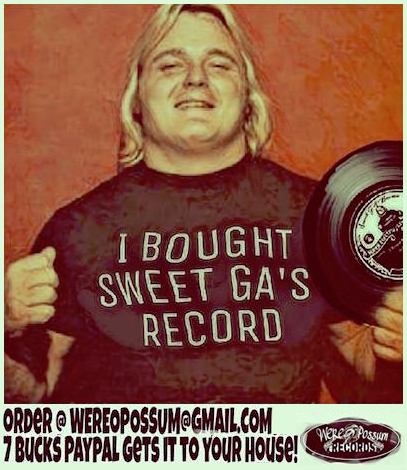 For complete details, visit https://www.facebook.com/Tmptofwrestling/. 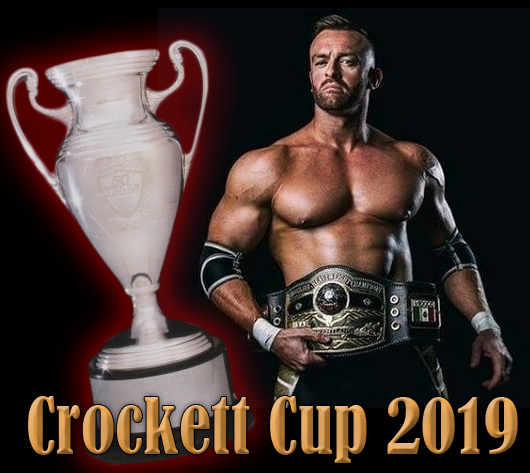 Don't miss all the excitement of Classic Pro Wrestling and the Crockett Foundation Cup this Saturday night! J.J. Dillon appeared today in a video-podcast interview with the good folks at WrestlingINC.com, talking about his history in the business as well as his upcoming appearance at the Trago/Thesz Pro Wrestling Hall of Fame Weekend in Waterloo, Iowa (July 20-22). 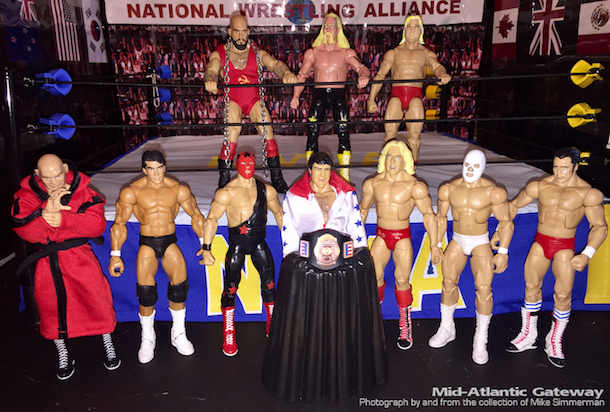 A new feature begins this Friday (7/14) on the Mid-Atlantic Gateway spotlighting old school action figures from the collection of Mike Simmerman. 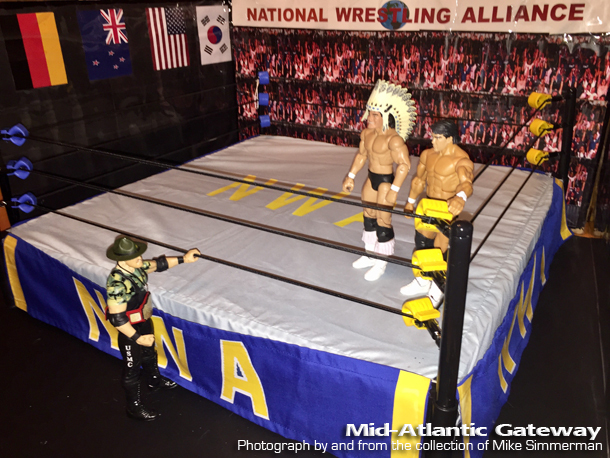 Or perhaps it is more accurate to say these are modern day action figures re-imagined and presented in an old school way set in a replica of the old TV studio of Mid-Atlantic Championship Wrestling. 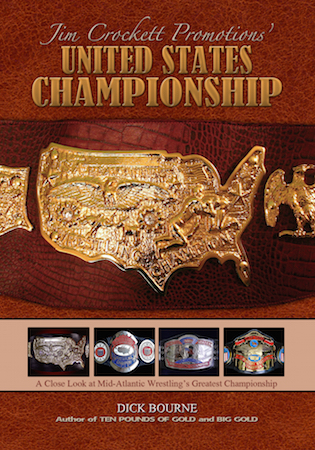 We'll see many of the great stars from the 1970s and 1980s, all decked out with ring attire designed from that era and championship belts that came from that era as well. Some were quick and easy for Mike to fix up, some took a lot of work and some creativity. All are very cool. 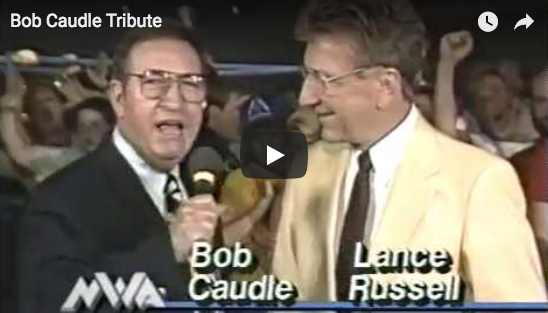 Look for a new photo each week that will trigger some great memories from the old WRAL and WPCQ studio days of Mid-Atlantic Wrestling. The photos are compliments of collector Mike Simmerman and presented here on the Mid-Atlantic Gateway. A new photo each week! 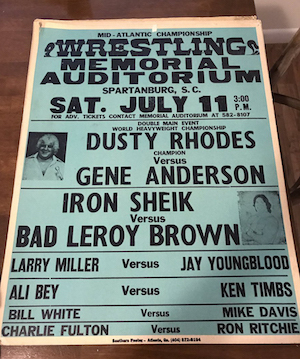 In July of 1975 a newcomer appeared on the Mid-Atlantic Championship Wrestling landscape, and his presence was impossible to ignore for a couple of reasons. First and foremost, the young Tony Atlas White was 250 pounds of bulging muscles that gave him the look of a bodybuilder who was doubling as a professional wrestler. 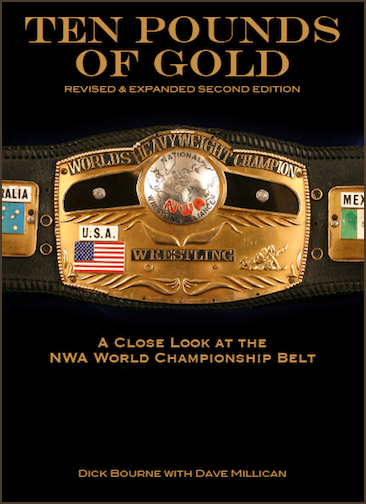 Secondly, Atlas hailed from Roanoke, Virginia, a town with a rich wrestling history in Jim Crockett Promotions. Atlas was given a bit of a push when he first began in the Mid-Atlantic area, even wrestling the fast-rising star Ric Flair early on in his tenure. Tony showed promise in the ring and was clearly an outstanding athlete, but he needed experience in the squared circle and was rarely given an opportunity to do interviews when he first started. While Atlas was plenty popular, he was never able to initially make a deep connection with the Mid-Atlantic fans, who more so just stared and marveled at his chiseled physique. 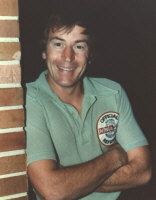 Tony spent 16 months in Jim Crockett Promotions, until November of 1976, honing his craft and performing solidly in mid card bouts throughout the Mid-Atlantic area. Building on his initial training with George and Sandy Scott, Atlas teamed often with veterans like Johnny Weaver, Ronnie Garvin and Swede Hanson and became a more seasoned and polished performer. When Tony left the Mid-Atlantic area at the end of 1976, he was not heard of for some time by his hometown supporters. Then about a year and a half later, Roanoke’s favorite son announced he was set to make his triumphant return home! Exactly a month later the “new” Tony Atlas returned to a Mid-Atlantic ring, defeating Greg Valentine in a top flight bout in Spartanburg, South Carolina on April 15, 1978. The new and improved Atlas was not only smoother in the ring, but his outgoing personality poured out and he was more popular than ever with the Mid-Atlantic fans. Tony wrestled as a main eventer in Jim Crockett Promotions straight through into July of 1979, when he departed his home area for good. 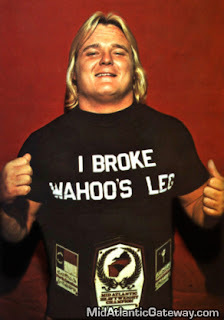 During his second Mid-Atlantic stint, Atlas became the Mid-Atlantic Heavyweight Champion defeating Ken Patera on September 17, 1978 and lost it exactly four weeks later to Patera, with both title changes occurring in his hometown of Roanoke. 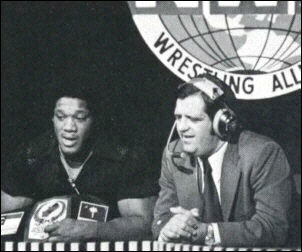 Whether it was becoming the Mid-Atlantic Heavyweight Champion, matching Ken Patera’s feats of strength on television, battling NWA Heavyweight Champion Harley Race on even terms or standing up to big Ernie Ladd after the “Cat” slapped him on TV, those and a lot of other big name wrestlers did indeed get straightened out by a Tony Atlas who had gotten himself together during his second stint in Mid-Atlantic Championship Wrestling during 1978 and 1979. Roanoke’s favorite son surely shined brightly when he returned home.